In a decree (1759), Clement XIII ordered the Trinity Preface to used on Green Sundays. This supports a strong case for the naming of these Sundays per annum in the old English (and North European) way as Sundays after Trinity. I draw attention to several points. The modern emphasis on Sunday as a weekly minipascha is true but too narrow. As Clement XIII's document points out, Sunday is also the day of the Creation of Light; indeed, of the beginning of Creation. And also of the Resurrection; and also of the Pentecostal gift of the Spirit. And thus of the Holy Trinity. The same Magisterial document refers to the traditional use on these Sundays of the Quicunque vult. I believe, and have written before on this blog, that the disuse of this Canticle (since the corruption of the Roman Rite really got under way under Pius XII) is one reason why even some clergy don't really seem to have any sense of the Trinity, as defined by Mother Church, any longer - they are, it sometimes appears, modalists. The fact that when the clergy of the English Ordinariate were being 'formed', a lecturer assured us that the QV was "heretical" is a disgrace which still stimulates my indignation. It also reminds us of the antiphon which usually came towards the end of Sunday Mattins: "Two Seraphim cried one to the other *Holy Holy Holy Lord God of Hosts, *All the earth is full of his glory. V Three there are who bear witness in heaven, Father, Word, and Holy Spirit: And these three are one. Holy ... Glory be ... All ...". This lovely text, of course, draws upon the verse in the Vulgate and the Authorised Version (Patrimony Patrimony) in I John; commonly omitted in modern Bibles including the Neovulgate because of its extremely weak attestation in Greek mss..
We need a reacceptance of a more holistic sense of Tradition ... and a recommitment to the noble crusade of rolling back the 'Enlightenment'. And finally: Clement XIII, in the actual words of the Decree itself, refers to the use of the Trinity preface on Green Sundays and says "inde a [not 'in'] vetustissimis temporibus in usu fuisse dignoscitur". In other words, the Holy Father does not say: I've had a perfectly spiffing idea; let's do so-and-so. He bases what he decrees on Ancient Tradition and Precedent. That is very significant. It is the immemorial Roman instinct for preservation and continuity. We need more of it. Especially in Rome. Not least in the Casa Santa Marta. I wonder if the Quicumque vult has ever been chanted in the chapel there. Okay, Reverend Father, you got me. I trust in some near-future post you will give us the etiology and the cure for "parablepsis due to homoeoteleuton." "Sunday is also the day of the Creation of Light; indeed, of the beginning of Creation. And also of the Resurrection; and also of the Pentecostal gift of the Spirit. And thus of the Holy Trinity." Since I discovered the traditional latin mass, I wondered why the Preface of the Holy Trinity has to be used on all Green Sundays (at least if no feast is to be celebrated on a Sunday occasionally, which does not have an own Preface, like f.i. the Feast of the Transfiguration. Then it seems to be that the ordinary Preface is to be used on a Sunday, even though the Preface of the Holy Trinity would be much more convincing especially for the Feast of the Transfiguration, which unfortunately lost the Christmas Preface under the Regime of "1962"). 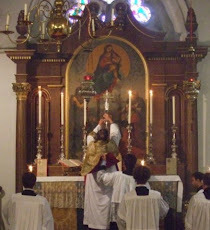 Now, I lately understood the wonderful background behind this practise, thanks to Father Hunwicke. The corruption of the Roman Rite, however, started already under Pius X. Not much as far as the Missal was concerned (because a thorough revision of the Missal was considered to need several decades of preparation), but as far as the Breviary was concerned. Not only the ancient Roman Distribution of the Matins and Vesper Psalms was disturbed by replacing it with a new Temporale distribution, created by an "expert committee", but also the joyful daily ending of the Lauds with its recitation of Psalms 148, 149 and 150 was given up. Just read on one "Green Sunday" Matins and Lauds by use of a pre-1911 Breviary, and you will understand painfully what has been lost here. I don't know either if Quicumque vult has been performed at the Casa Marta but I do know that the Bishop of Rome was having a bite today, a 'solidarity luncheon', with some prisoners and refugees inside Bologna's San Petronio Cathedral Presumably a sacred place). Fortunately there was a significant media presence there so it was all recorded for posterity. "It is the immemorial Roman instinct for preservation and continuity." I regret giving any impression that Pope Bergolio's 01 October 'solidarity luncheon' with refugees in Bologna's San Petronio cathedral was an event staged for the cameras. Clearly the poor fellow does not get a moment's privacy. Having written my earlier comment, I later recalled this tragic photo-shoot on the Feast of the Annunciation this year. No opportunity to even go down to the little house of easement at the bottom of the garden. "Pope mobbed by cameraphone-wielding crowd while using Portaloo"